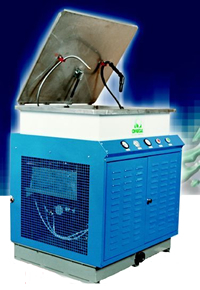 Maratek FLW-II is a true industrial parts washer with built-in solvent recyclers. Independent of the type of solvent you use, the FLW-II will provide professional parts cleaning capabilities with the advantage of continuously working with pure clean solvent. Why use a Maratek FLW-II? The FLW-II system is built to industrial specifications and can be used for a variety of different solvents. It is approved for use with SCAQMD Non-Voc solvents but can be used with the solvent of your choice. 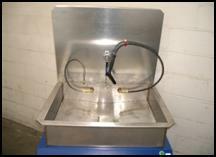 The system is PLC controlled for simple operation and has a true stainless steel sink. FLW-II models are tailored to meet your requirements to allow for easy integration into your production process. Options include FLW-II Satellite units that can be configured to work with a central solvent recycling unit. Contact us to discuss your specific needs or for more details and equipment specifications.